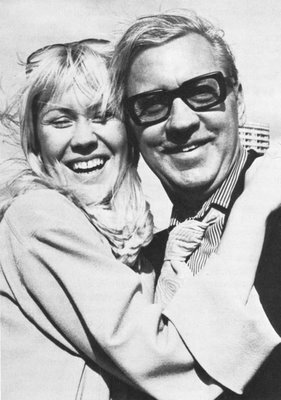 Agnetha and her father in the city of Warsaw (Poland) in October 1976. Now looking at these fatherspix, have you noticed the similarity between daddy Faltskog and daddy Lyngstad?? Same hair, same glasses, the same whole look/appearance... And what if they basically were the same person?? Oh my gosh, now we know: Frida and Agnetha ARE SISTERS!!! Yes I *did* notice that indeed! Could it be the same person? Would it? Is that why Frida said they have a sisterly relationship????? Bjorn and Agnetha on stage together late 1979.